Creamy greek yogurt bark decorated with M&M’s® Milk Chocolate in a design that makes it look just like a Twister game! 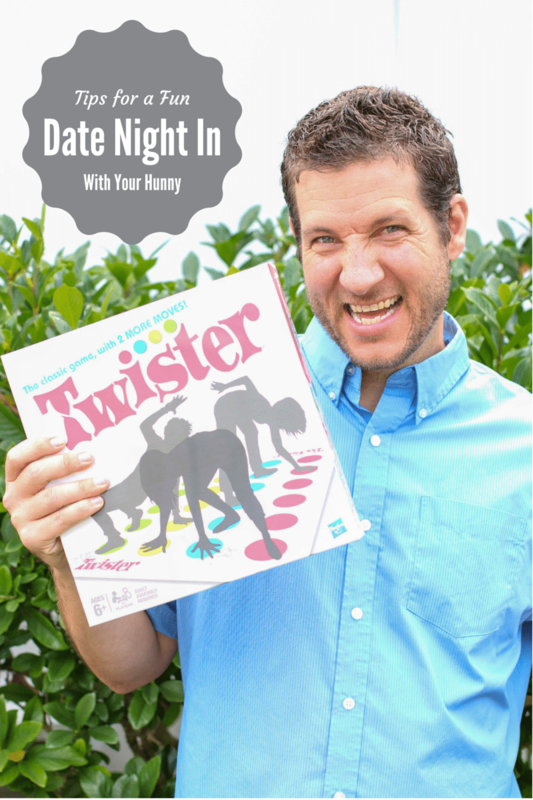 Plan your own date night in with games and treats with your hunny! Our friends and family are usually pretty surprised to hear this, but Travis and I rarely go out to dinner. We like to know where our food comes from, and what’s in it. We’re on a budget and saving for our dream wedding. Last Wednesday, we finally came to a decision and booked our wedding venue! We’re pretty excited, scared, nervous and all of the big feelings you could possibly imagine all rolled into one! We wanted to celebrate it, so we planned a date night in on Thursday. Put away the phones and tablets! It’s important that you focus on each other without distraction. Dress casual. Don’t dress up so you’re uncomfortable, but definitely don’t start the night off in your pj’s. Somewhere in between is perfect! Cook something special. Decide together on something you want to splurge a little bit on, nothing crazy but something you wouldn’t normally serve on a regular night. Make it feel special! Rent a movie, or stream & binge watch a new series together. When we used to go out for date night, we mainly went to dinner and a movie. Dinner and a movie at home will still give you the one on one time and entertainment, just with a lower price tag. Pull out the games! Having an activity to do is great for loosening up, having fun, and enjoying each others company. Make snacks! Game night or going to the movies aren’t complete without snacks! You gotta have them at home too! Date night in was a lot of fun, except Travis is really competitive so he can get pretty heated if he’s losing the game we’re playing. Me, not so much. I’m just in it for the fun. ? We both work a lot, and some days we only see each other in the morning, and for an hour or two at night. We love planning game nights in so we can spend time focused solely on each other while doing a fun activity at home where we can relax. It’s an easy way to spend quality time together and make new memories that don’t cost a fortune. Is it wrong that I like to tease Travis about games that I win? Travis will tell you he’s a Twister game master, but it’s not true! He’s all talk! We didn’t see any movies that we were interested in, so we ended up binge watching 6-7 episodes of Fuller House. We both loved it. The show is hilarious, and I love that it’s focused on the three girls now, just like the original premise with the three men raising the kids. I’m so excited that it was renewed for a second season, I can’t wait. 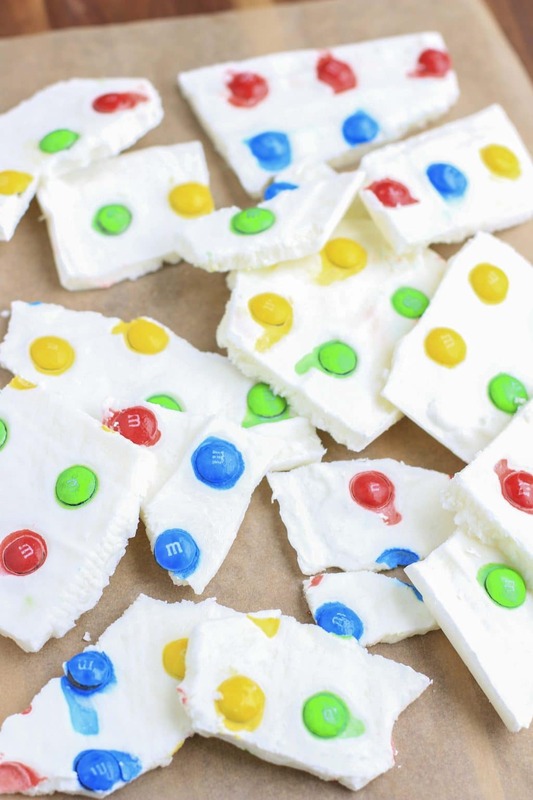 I whipped up super simple greek yogurt bark and added M&M’s® Milk Chocolate in a formation that looks just like the real Twister game board! How fun is that! I spread the greek yogurt on a small tray in the afternoon, arranged the M&M’s®, popped it in the freezer, and they were ready by the time we were done with dinner. These are so easy to prep, the only work required is the getting the placement of the M&M’s® Milk Chocolate in straight, equal lines. Or maybe it was just hard for me because I’m a perfectionist, who knows. Make sure you use greek yogurt, not regular yogurt, because greek gives it an extra thick & creamy consistency and flavor. 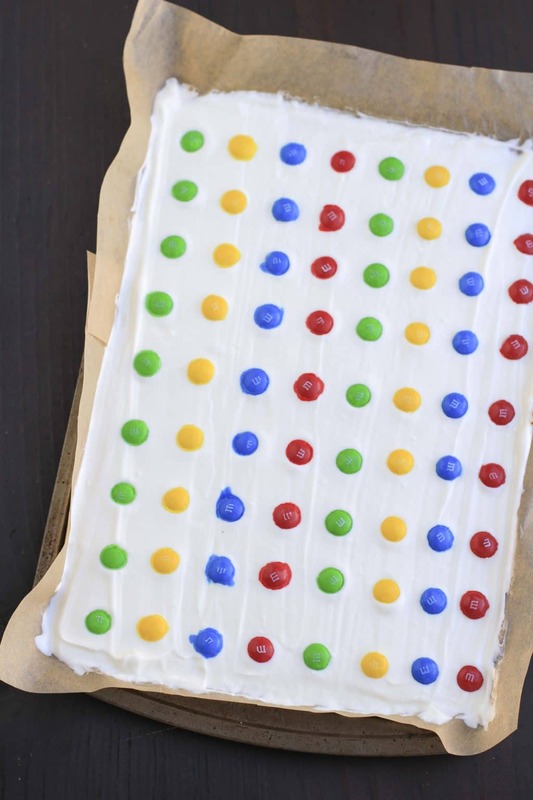 Creamy greek yogurt bark decorated with M&M's® Milk Chocolate in a design that makes it look just like a Twister game! Line a 9x13 inch tray with parchment paper. In a large bowl, combine the greek yogurt and honey. 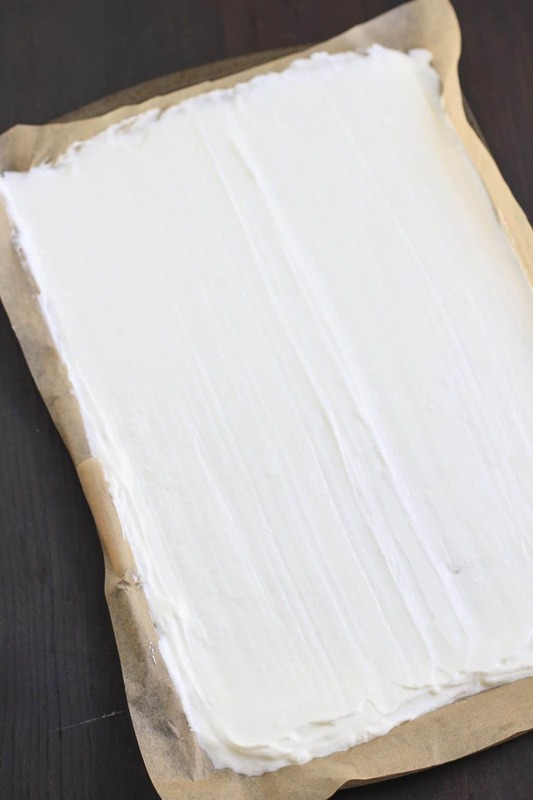 Spread the yogurt mixture onto the tray a smooth it out using the back of a spoon or pastry cutter. Arrange M&M's® Milk Chocolate in a Twister game pattern. Freeze for 3-4 hours or until firm. Cut into squares or break into big chunks. Enjoy immediately, store leftovers in an airtight container in the freezer. What’s your favorite classic Hasbro® game to pull out for date night in? Let me know in the comments!